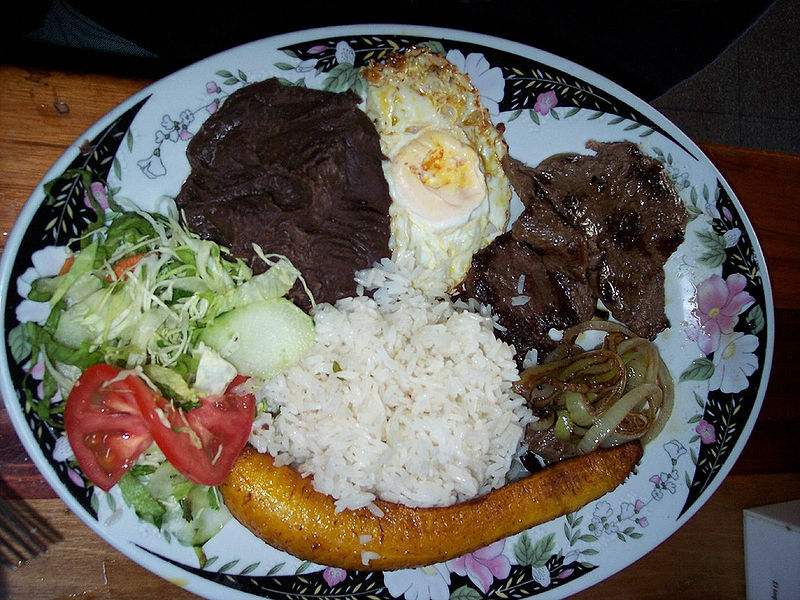 A Casado is a typical Costa Rican meal consisting of rice, beans, fried plantains, salad, a tortilla, and an entree of choice that may include chicken, beef, pork, and others. Left: A Costa Rican lunch, called casado. Comes with rice, fried plantain, onioned meat (chicken or beef), an egg, beans and a cabbage salad sprinkled with lemon juice and salt. The origin of the term is related to an expression said by the clients, in which they claimed they wanted to be treated as a casado (married-one), claiming that married men ate meals in that fashion, which is true since Costa Ricans typically eat a meal like that at their homes for lunch and/or dinner.